The next class will be Sunday, April 28, 2019. Want to know more about what we believe and how we function as a local church? 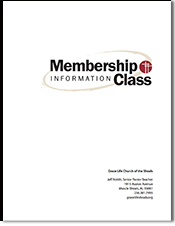 The Membership Information Class is the place to learn about Grace Life Church without being put on the spot or without any obligation to join us as a member. Different aspects of our church’s beliefs and practices will be shared during this one-day class that is held on a Sunday. The first sessions are from 9:00 a.m. until noon. Refreshments are available prior to the class to give time to fellowship with others who are contemplating membership at Grace Life Church. The final session resumes at 5:30 p.m. beginning with supper. Childcare is provided for those with younger children. To join the next class complete the registration form below.